- A proposed school and office building on Route 108 would bring up to 150 jobs to Sandy Spring, but not everyone's excited about it. The three-story building "definitely does not preserve and enhance rural village character," says Michelle Layton of the Sandy Spring-Ashton Rural Preservation Consortium. Supporters say that Sandy Spring won't get the little shops and boutiques they want if people aren't there to shop in them. - There may not be any funds to renovate the Old Blair Auditorium, much to the chagrin of the project's supporters. The forty-year-old hall, adjacent to the former Blair High School on Wayne Avenue, has sat empty since 1998; last year, Calverton-based architecture firm Grimm + Parker did a feasibility study to see how it could be re-used. - But there is another new local blog: What's Up Wheaton, though there's some Kensington in there too, because that's where the couple who writes it now live. They've already delved into Big Issues like the financial troubles at DeJaBel Cafe and the new Montgomery Royal Theatres. It's strange they'd write about said cinema while tweeting that they're going to see a movie in Tysons Corner, but this can be forgiven. JUTP wishes them the best of luck! UPDATE: the photographer informs us the photo was taken at the corner of East-West Highway and Grubb Road in west Silver Spring. I knew I recognized the houses in the background, particularly the one with the grey-purple porch. I wonder if people who live on major streets or highways realize how famous their houses are. - The ongoing budget crisis means the Connect-A-Ride D bus, which runs between Burtonsville and the Laurel Mall, will be discontinued at the end of the month. Central Maryland Regional Transit, which operates the twenty-year-old route, says cutting it will save them $100,000. Dan. despite the ambiance of Sandy Spring,,we do not need more traffic on 108. It is not a big road,and many people use it for a short cut to other places. Their are some stores, diners and other stores that line 108. Theu do not need to be moved or put out of business. You had the correct county for the Photo of The Day. I took it at the bus stop at the corner of East/West and Grubb. I swear we didn't know about the new Wheaton cinema. It didn't get as much fanfare as last year's failed Drafthouse experiment. Many thanks for the referral. Can you imagine the amount of traffic that would be generated by new businesses that would need up to 150 people to run them? 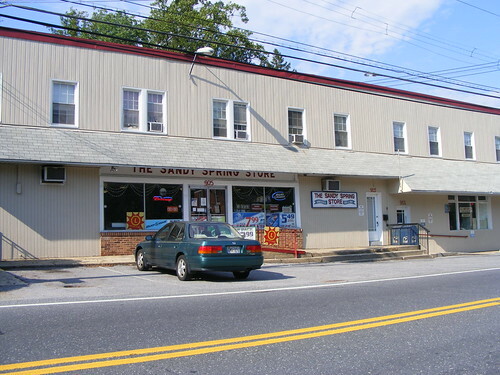 They would need to widen the road and Sandy Spring would lose all of its character and charm. Of course this is purely selfish since I often willingly drive a few minutes out of my way just to get a temporary little escape from suburbia and to enjoy the fine delicacies at the French Bakery there. I swear those confections would not taste as good if they came from a new building! What can you do in Tysons that you can't do there? Great photo! I love how you saw beauty and interest in what for most of us is an everyday place.